It has so little to do with the preacher, if any. Believe me. In fact, I think it has NOTHING to do at all with the preacher or program. I've listened to a lot of boring preachers but I didn't doze off. Lousy programs bore me but I don't get sleepy during worship programs--though I'd be aching to go home ASAP. Sleeping in bed is better. You're sleepy simply because you're sleepy. You're either tired or lazy. Worse, you're carnal. By God's grace, people are wide awake when I preach. Probably they watch and wonder about my gray hair or red nose. On some occasions, I catch 2 or 3 sleepers and I let them enjoy their nap. Some preachers would be offended. Not me. Like Paul, I'd let them sleep and fall off from the third floor. After they regain consciousness, they become totally changed. Some are honestly tired. They did something important Saturday night, spent overtime on it and I understand that. Some unthinking companies require it. So, they go to church groggy. What do you expect? 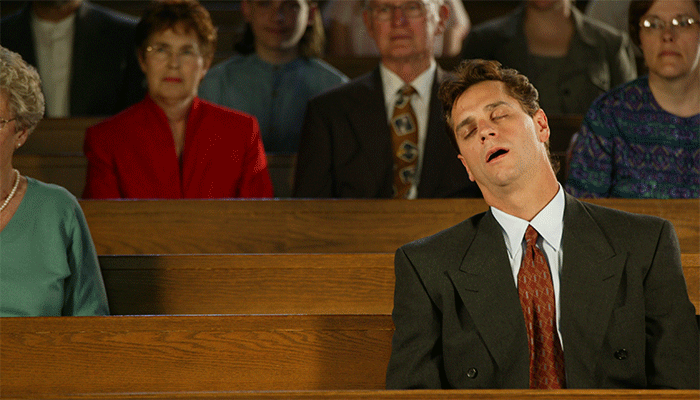 But anointed preaching can wake them up like they've gobbled up tons of caffeine. Oh, anointed preaching can also send you off to a deep sleep, like what happened to Paul and Eutychus. And the prophet Daniel fell asleep while an angel was talking to him. See? Stop being too tired. Click here. Some people yawn while you preach. It's a sign of exhaustion, not from your preaching but from something else. Like not getting enough sleep the night before. They yawn as an automatic body mechanism to get more oxygen to the brain to wake up brain cells. I yawn a lot of times when my neurons signal the body for more oxygen--not because I'm bored with the preaching--especially during the unholy hours of the day. 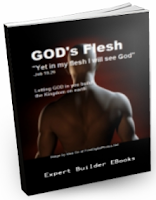 Health and weight loss from the bible. Click here to see video. But some are just plain lazy. They can't stand serious talks and drift away into deep sleep in the middle of preaching--or even worship singing (you see the same folks sleeping right in the middle of important dialogues when they watch a good movie). Yup, I've seen folks fighting off sleepiness while singing. You see them alert during gossips but sleepy during sermons. I'm sure these guys never enjoy the bible. They just want to watch silly videos on Youtube. But here's one thing for sure--the devil is right beside you each time you feel sleepy in church, especially when the Word is being declared. Specifically, the devil steals from you when you're sleepy. Remember the parable? The devil lures you so that the Word you hear ends up like the seed that fell along the path. Jesus said, the devil is sitting beside you grabbing the Word sown in your heart. The devil cannot get the spoken Word by himself. He only gets access to it when you sleep in the middle of preaching or quiet time or bible study. Ordinarily, he just gets the written, not the spoken Word (only true sons and daughters get the spoken Word), unless you give it to him when you sleep on it. Like how Adam gave Satan the title "the god of this world." You give the devil the spoken Word with your laziness so he becomes wiser than you. One little push and he easily demolishes your faith, or tricks you into believing a lie. Here's how the devil does it: beginning Thursday he lures you to abuse your body. You stay out late at night or watch TV or play computer games till the wee hours of the night. Or up to dawn. Then you wake up late the following day, and that upsets your body clock, ruining your natural sleeping and eating hours. So Friday, you eat late and sleep late again. By this time, you've lost a lot health-wise already. But because it's Friday, the devil lures you again to spend time for your night life. Saturday, you feel worse. But then you further abuse your body. You go out with friends and stay late or play heavy sports despite your lack of sleep. Or go on overtime work. Or simply watch late TV programs or play computer games again. So, come Sunday morning, you're in no mood for anything, much less listening attentively to preaching. And you never knew it was all the devil's scheme to make you sleep on the Word and grab it from you. You never knew because you're dead. Too dried up. Amos calls it famine of the Word. Your spirit is dead for having that lifestyle each and every week. You thought it was just a bad habit God would understand. Nothing spiritual. But it is. You fall right into the hand of the enemy. Your spirit cannot discern anything because it's dead. And it's dead because you don't get the Word. Spiritual famine. So you go to church and sleep amid preaching. And if the preacher has little imagination, he'd allow himself to be distracted by the frequent jerking of your head as you try to fight off sleepiness. He'd be upset and disconcerted, even angry. So the devil now succeeds in demolishing your faith and the preacher's spirit. And both of you will never know you just lost a spiritual battle and made the devil wiser. The Word should not make you lazily fall sleep. It is "alive and active" says Hebrews, and "penetrates even to dividing soul and spirit, joints and marrow." How can you go to sleep with that? Well, the Word does provide good sleep after you hear or meditate on it, as when Jeremiah was soundly asleep, dreaming about the Word, and said "At this I awoke and looked around. My sleep had been pleasant to me," [31.26]. And a Psalm says, "I lie down and sleep; I wake again, because the LORD sustains me." I find that I have sound sleeps at night after meditating God's Word. But when listening to preaching, I stay awake even if the preaching seems nonsense.